Is This a Lisfranc injury? or just a sprain? Hello, I am a 25 year old woman. 11 days ago I fell: a tile from de street was missed, so i fell to the floor. I think I twisted my right foot. I thout it wasnt anything serious, so I wanted to go home. 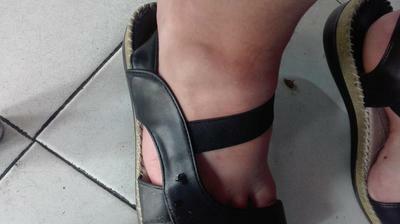 But some minutes after that, I saw that the midfoot area, to the right, was very swollen. So I went to the Hospital. I had some X rays, but the doctor didn't see any broken bone. Only, a small avulsion on the Cuboid. He touched my foot, and told me to walk. 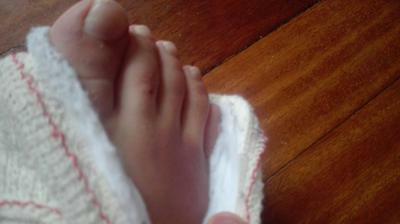 The diagnosis was: metatarsal sprain and cuboid avulsion. The problem is that I have been these days reading a lot of webs, and I see that a sprain in the midfoot is always a Lisfranc Injury, wich is horrible. But the doctor only put me a splint, and told me that two weeks after that, They would remove the splint and put me a bandage. Can this be a Lisfranc injury? I dont find another diagnosis in the internet for my injury... Now , 11 days after the accident, I dont have pain (I am still no weight wearing), but I have a big bruise that goes from near my fingers, to the midfoot. If it is this injury, wouldnt I need a surgery or more time no weight- wearing and with the splint? This is probably not a LisFranc inury unless the metatarsal bone is also affected by the fracture. An avulsion fracture is where a piece of bone is pulled away from the main bone usually as a result of trauma, in this case your fall eleven days ago. It is also not a sprain. You did not supply me with x-rays to look at, and the picture of your feet before and after, does not help me either. Based on your narrative, it appears your doctor is doing the proper treatment. The most important part of the treatment is to stay non-weightbearing until your next appointment with the doctor, regardless of the fact that the area no longer hurts. If you start bearing weight, you run the risk worsening the fracture. Making the assumption that the avulsion fracture is in close approximation to the main cuboid bone and the fact that you are young and hopefully do not smoke, you should heal in a very short period of time. Let your doctor be the judge as to when your treatment is complete.